Parking is $12 per vehicle and $6 per motorcycle. Parking lots open daily at 7:00am. For everyone’s safety, local authorities only allow right hand turns into the Fair Park along all bordering streets (S. 84th Street, W. Greenfield Avenue, W. Kearney Street, S. 76th Street). All parking is first come, first served. Certain gates are restricted for special use, and gates may close if parking lots are full. 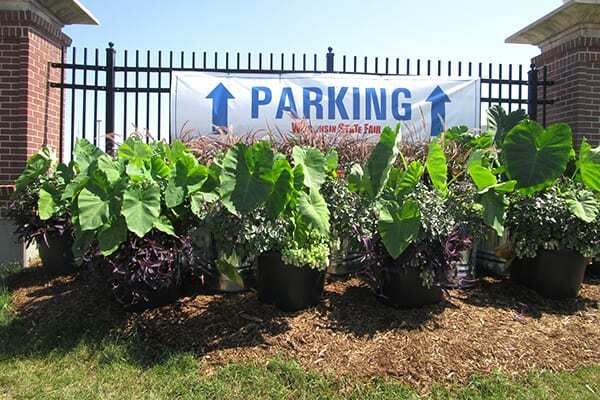 You will pay for parking upon entering the lot in your vehicle. Once parked, proceed to the nearest Fair admission entrance. If your vehicle leaves the parking lot, you will be charged for parking upon re-entry. Gate 7 – located on Kearney Street (I-94 Frontage Road). For only $25, skip the walk with prime parking! A limited number of Preferred Parking spaces are available near the Main Stage Entrance via Gate 1 and near the U.S. Cellular® Main Gate Entrance via Gate 7. For more details, and to purchase date specific Preferred Parking prior to the Fair, please click here. These VIP spots go quickly – advanced purchase is recommended! Jack’s got your back with trams that service the Milwaukee Mile infield parking lot and drop off/pick up at several admission entrances. Trams are available from approximately 9 am until 9 pm. Save gas and get some exercise when you Pedal to the Park! Fairgoers are encouraged to get outdoors on their way to the Fair and utilize the Hank Aaron Bike Trail. FREE bicycle parking is available in lots near the U.S. Cellular® Main Gate and Gate 2 at S. 81st Street and W. Greenfield Avenue. A map of the bike trail and parking locations are available here. Ride UBER to and from the State Fair! Pick up and drop off of all UBER rides during the Fair will be at the State Fair Transit Center. NEW to UBER? Use code WISTATEFAIR18 and you will receive your first ride FREE up to $10 (New users only. Offer expires 8/31/18). Fairgoers can exit the Fair Park between Gates 3A and 4 to catch their safe ride home with MCTS at the Transit Center or follow the signs to the new Uber, Lyft & Taxi lot just south of the buses. For info on shuttles and freeway flyers, please click here. Wisconsin State Fair Park is conveniently located near the interchange of I-94 and I-41/US-45. Whether you are travelling from the north, south, east or west, see below for options on directions to the State Fair. Or get directions here. I-41 Southbound to I-94 Eastbound. East on I-94 to 84th Street exit. At stoplight, continue straight onto West Kearney Street. Turn right into North Parking Lot. If lot is full, proceed to 76th Street and turn right for additional parking options. I-41 Southbound to Bluemound Road exit. Left (east) on Bluemound Road to Glenview/84th Street. Right (south) on 84th Street to Kearney Street. Left (east) on Kearney Street to the Wisconsin State Fair North Lot on right. If lot is full, proceed to 76th Street and turn right (south) for additional parking options. I-41/894 Northbound to I-94 Eastbound. East on I-94 to 84th Street exit. Cross 84th Street to Kearney Street. East on Kearney Street to the Wisconsin State Fair North Lot on right. If lot is full, proceed to 76th Street and turn right (south) for additional parking options. I-41/894 Northbound to I-94 Eastbound. East on I-94 to 70th Street exit. Right (south) on 70th Street to Greenfield Avenue. Right (west) on Greenfield Avenue to the Wisconsin State Fair on right. I-41/894 Northbound to National Avenue exit. Right (northeast) on National Avenue to 84th Street. Left (north) on 84th Street to Kearney Street. East on Kearney Street to the Wisconsin State Fair North Lot on right. If lot is full, proceed to 76th Street and turn right (south) for additional parking options. I-94 Westbound to 68th Street exit. Continue west on O’Connor Street to 70th Street. Left (south) on 70th Street to Greenfield Avenue. Right (west) on Greenfield Avenue to the Wisconsin State Fair on right. I-94 Westbound to 68th Street exit. Continue west on O’Connor Street to 76th Street. Left (south) on 76th Street to the Wisconsin State Fair on right. I-94 Westbound to 84th Street exit. Left (south) on 84th Street to Kearney Street. Left (east) on Kearney Street to the Wisconsin State Fair North Lot on right. If lot is full, proceed to 76th Street and turn right (south) for additional parking options. I-94 Eastbound to 84th Street exit. At stoplight, continue straight onto West Kearney Street. Turn right into North Parking Lot or proceed to South 76th Street, turn right and proceed to gates on South 76th Street or West Greenfield Avenue. I-94 Eastbound to WIS 100 exit. Right (south) on WIS 100 to Greenfield Avenue. Left (east) on Greenfield Avenue to the northbound entrance ramp at Greenfield Avenue to I-94 Eastbound. East on I-94 to 84th Street exit. Cross 84th Street to Kearney Street. East on Kearney Street to the Wisconsin State Fair North Lot on right. If lot is full, proceed to 76th Street and turn right for additional parking options.